The 1/10 oz Gold Maple Leaf is one of the world’s premier gold bullion coins. Manufactured by the Royal Canadian Mint, it was first introduced in 1979 as a way of competing with the South African Krugerrand, which made up 90% of the market by 1980. 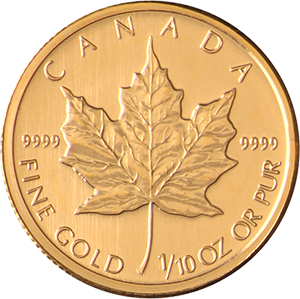 The 1/10 oz Gold Maple Leaf was first introduced as a standard weight in 1982 and remained the smallest denomination until the introduction of the 1/20 oz and 1/15 oz in 1993 and 1994 respectively. In 2013 the 1 gram Maple Leaf surpassed these as the smallest (and therefore most affordable) Maple Leaf gold bullion coin available. Other weights include the 1/2 oz and 1/4 oz, both introduced alongside the 1/10 oz coin in 1982, and the iconic 1 oz Maple Leaf, which was the first incarnation of the coin in 1979. The 1/10 oz Maple Leaf, like all Maple Leaf coins after 1982, is of the highest purity at 24 carats. This makes it one of the most valuable gold coins relating to gold content alone. This does mean that the coin can be malleable, however, so it is essential for the coin to be handled and stored with care to avoid depreciation in value over time. 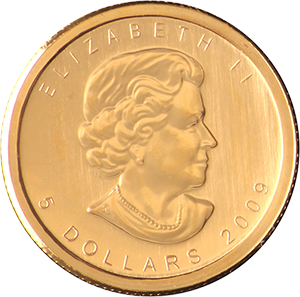 The design of the standard 1/10 oz Gold Maple Leaf depicts the figurehead of Queen Elizabeth II on its obverse. This portrait was changed in 1990 to show the monarch at 64 years of age. In 2005, this changed to the portrait seen on coins minted today, depicting the Queen aged 79. The coin’s inverse shows the iconic Canadian Maple Leaf. Maple Leaf coins also provide a large amount of variation with special editions, with coloured gold, bi-metallic, special edition weights and holographic designs. These have been issued to celebrate, among other things, the coin’s anniversary, the Vancouver Winter Olympics and Canadian national anniversaries.